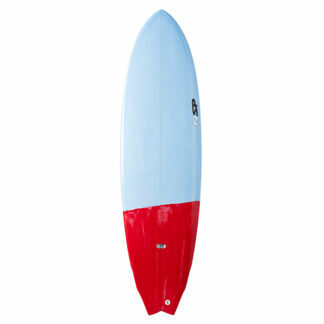 The NSP Classic Fun Surf EF Surfboard is designed to be fun in your most surfed conditions. From 1′ to head high it’s packed with features to give you more time on the waves. It’s got a fuller nose so catching waves is easy. It’s fuller through the middle so you get stability for trimming. In the tail the extra width helps you when first getting to your feet so the board doesn’t sink under you. The bottom has a slight concave. This also helps you get waves and once on the wave will give your speed and holding to get around the foam out onto the clean open face. The rounded pin tail is a classic design so you get smoothness and flow. Construction is of NSP’s high technology. A vacuum epoxy process that NSP claim is eco-friendly moulds the shape around a foam core. The epoxy outer has a range of finishes. 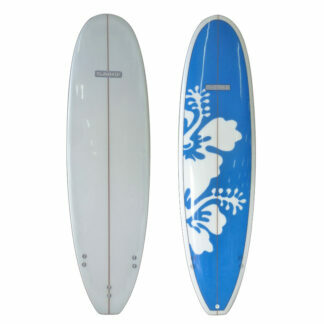 Featuring the FCS Original fin system you’ll be able to change the performance of the board. Different fins and fin combinations can be used for different conditions, small or big days. True to its name, the NSP Classic Fun Surf EF Surfboard will give you fun surfing and comes in a range of sizes that provide performance for surfers of all skill levels.